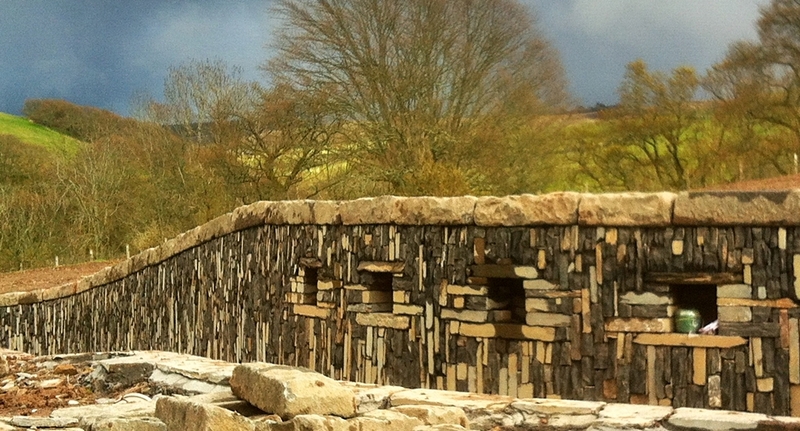 After many months of hard graft building the drystone walls at Tonguey Field House the project is nearing completion with only the final touch to be added, installing the eight feature carvings that will become focal points within the walls. If I was given a choice stone carving would be my preferred medium, there is something special about the process, looking at the raw block imagining it’s possibilities and then knocking ‘seven bells out of’ it to reveal the form within. To be set within the eight alcoves that I have already built into the walls I have always had a firm picture in my mind since the design stage of how I wanted these to look. Abstracted, organic forms each with a different character but relating to one another in size and feel. They needed to be simple forms that are not too fussy in detail as they will work as a group across the facade of the wall. For seventeen years and one house move I have had four of the rough blocks kicking about my garden, awaiting the right project to come along. The granite carvings have been made from an old broken gate post that I picked up from a stone merchants. Not 100% sure of its type but I’m fairly confident that it would come under the definition of ‘Balmoral’ Granite probably originating from the Aberdeen area. Hard to work it takes on a brilliant polish that has opened up lots of potential to play around with contrasting texture and colour. While working up at Beinn Eighe Natural Nature Reserve near Kinlochewe installing some gateway signs in 1995 a guy, can’t remember his name, stopped to have a chat, he was the quarrymaster at a marble quarry up the road and he invited me up to see the Quarry. 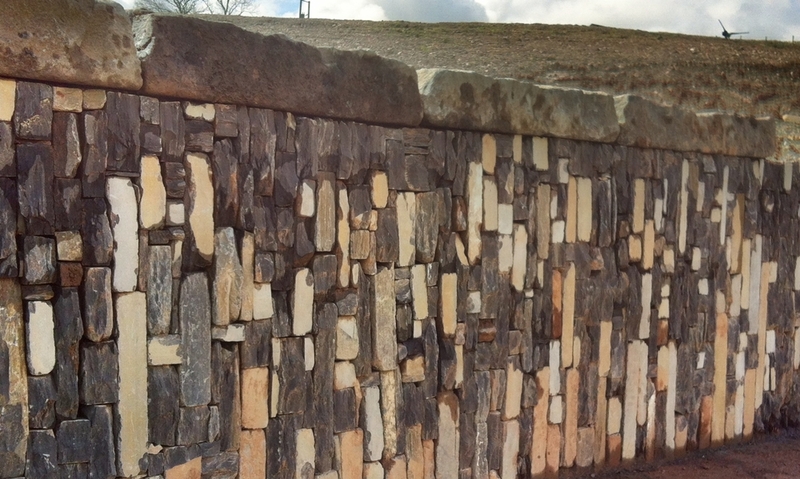 If you have any interest in stone at all a visit to any quarry is like being allowed into the best sweetie shop!! The quarry was owned by an Italian Company and was in the process of working the face down to get the best quality marble which is many meters down. Ledmore is a special stone in that it has a fantastic mix of greens and browns through it which I believe is pretty special in terms of marble. Loading the trailer with the biggest blocks I could lift I returned home with them to see ‘what lay within.’ Seventeen years later I have finally been able answer that question. The remaining four carvings are made from Forest Of Dean Sandstone. Once the set are completed I’ll do a page which details my process in more detail, from initial sketch design through to completed installed carving. Had a great session with the kids at Recharge, Tranent today. As part of helping develop a new community park in the town, I am undertaking a series of community engagement workshops to promote the project and initiate discussion as to ideas to include in the design. 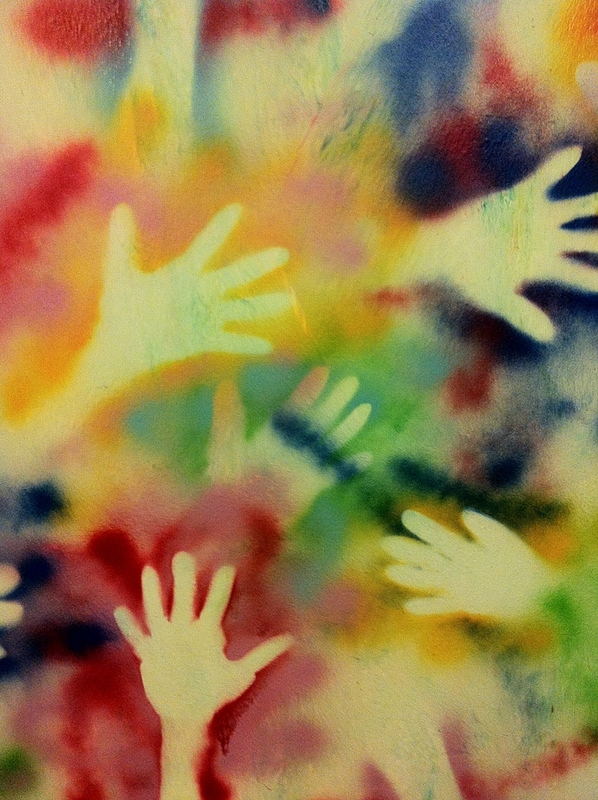 As part of this process I was keen that the youngsters of Recharge come together to enhance ‘their’ space, towards this end I stepped back in time and stole an old idea, (at least 10 000 years old) to decorate a wall with hand prints. I think the results speak for themselves – fun activity that got all involved, even the boys! Looking forward to getting them more involved as the project develops. – A little aside. Being more used to working with stone etc. 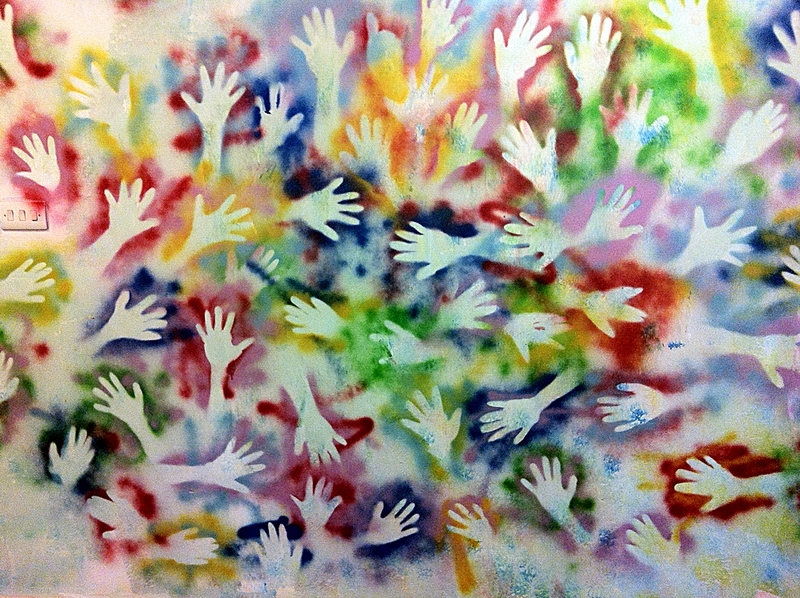 what a treat to get involved with colour – sheer positive joy! Set in the heart of rural Perthshire sits a high tech contemporary German kit house, with stunning views across the Strathearn Valley towards the Highlands, within the garden I am busily constructing a feature wall and drainage rill. Made from Caithness stone and laying it vertically using dry stone technique ( no mortar) it is becoming a major feature within the overall landscape scheme planned for the Garden by Landscape Architect Martin Stevens of Edinburgh firm HarrisonStevens. 240 tons of stone have been used so far! in creating the walls and with landscaping beginning shortly the clients are beginning to see the rewards of commissioning such an innovative and durable scheme.